Lavish Netflix drama The Crown returns today, picking up where it left off in the first series. Ten episodes trace the next 10 years of Queen Elizabeth II’s life, as imagined by writer Peter Morgan. 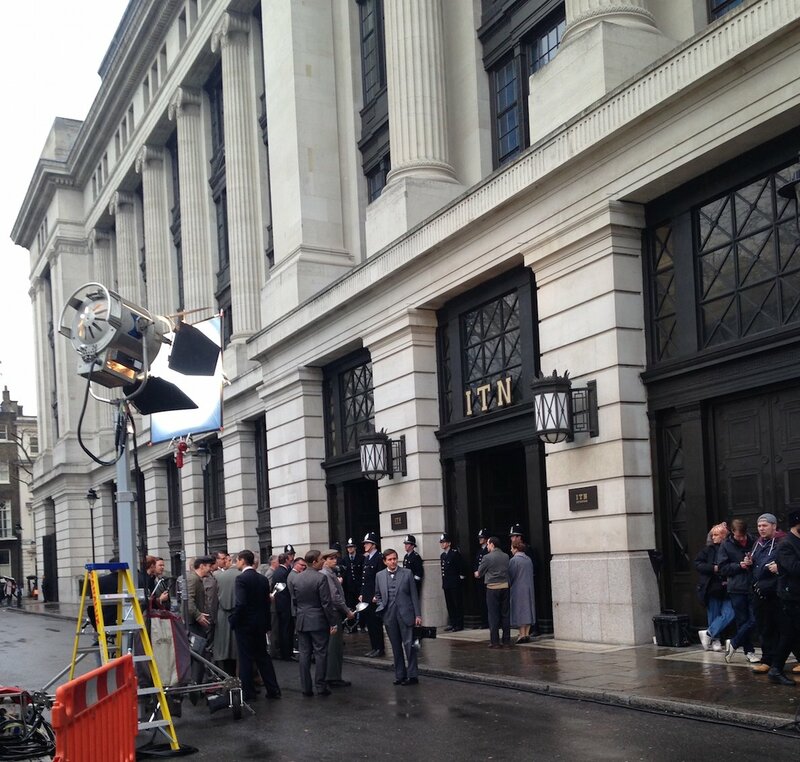 The production made a welcome return to London streets, along with a day’s shoot in Suffolk. FilmFixer manages the film office service for Camden, Haringey, Southwark, Croydon and Screen Suffolk. FilmFixer director Karen Everett says, “For this series we saw Suffolk double as Ghana, the HMS Belfast moored in the Thames in Southwark played the Royal Yacht Britannia, Addington Palace in Croydon was Clarence House and some really important scenes turned Victoria House in Bloombsury into the old ITN studios in Kingsway. “You can almost tell from the use of locations that this series moves outside the confines of the palace and gets among the people of the Commonwealth. Times really were changing. The production filmed at Elveden Hall for a day in May, the last day of the shoot. “The stunning Eastern interiors are a hangover from when the Maharajah of the Punjab, Prince Frederick Duleep Singh owned the hall. He was creating these beautiful rooms in the 1870s. In London, the HMS Belfast plays Prince Philip’s home for five months as he tours the far corners of the Commonwealth on the royal yacht, opening the 1956 Melbourne Olympics and visiting Papua New Guinea. In March 80 cast and crew filmed in Bloomsbury Square where Victoria House played the iconic ITN studios which used to grace Kingsway in London. These scenes highlight the pressure on the monarchy to modernise. They are based on a real 1957 interview by Robin Day with the then Lord Altrincham, who recalled the events in a Spectator article in 1997. In particular Lord Altrincham believed the Queen should spend more time abroad, given that air travel was now possible. He thought she should even live abroad in at least one of the many Commonwealth countries outside the UK. Lord Altrincham later disclaimed his peerage and reverted to his birth name John Grigg. In Croydon, Addington Palace plays the important role of Clarence House, home to Princess Margaret and the Queen Mother. Karen Everett continues, “The production returned to old Hornsey Town Hall in May this year for interior and exterior scenes involving 150 cast and crew. The production also used this location for the first series. Along with the considerate and well managed filming, Karen Everett praised the production for its positive relationships with locals, while filming in their neighbourhoods. She explains, “A local enthusiast trying to break into film was invited on a set visit, and generous donations were made to local residents groups Friends of Bloomsbury Square and the Rugby and Harpur Residents Association, both in Camden. Charles Cattel-Killick is a recent graduate who hopes to break into filmmaking. He works in Bloomsbury and his company received advance notice of the filming. On reading it, he approached the location manager, asking if he might be allowed a set visit, to see how the business really works. He says, “The location manager was extremely friendly, and on the day I found myself standing with the producer, director, editors and makeup people, for the scenes in and around Victoria House. “There were quite a lot of extras, as photographers and journalists, as well as the protesters, and policemen. It was a revelation to see just how much effort goes into some of these scenes. “We saw the cars pulling up, as the characters walked in to Victoria House. I was shown the interior, where there was a shot set up as the characters left the studios and headed outside again before the incident takes place. “I learned so much that could never taught on a course. Despite all the hard work that had gone into organising the shoot, someone had parked a big green van right in shot and nobody could find the owner. So they used a couple of the actors, dressed as policemen, to cleverly mask the van. “I could see how the interior had been dressed, very simply, to remove all modern day fittings from the shot. “And probably the most interesting aspect was to see quite how important each and every role is, from marshalling and running all the way up the line. If one person doesn’t do their job properly, the whole thing falls apart. “During and in-between takes everyone is looking at their own thing, watching the monitors and making sure their component is up to standard. Everything runs very efficiently but in the same breath the crew also find the time to have a laugh and create a very positive buzz about the place. “My own short I’m working on is a period one; although it’s set during the great war maybe visiting The Crown set made me think it’s achievable goal! This new understanding of how many people it takes to look after so many jobs is going to be very helpful. It was the third local production Charles has visited, as a simple result of responding to the advance notice from location managers. He also watched the BBC’s Howards End filming outside the British Museum. And from 3am one freezing morning earlier this year, he followed the filming of Woody Harrelson’s live screened, one-take feature film Lost in London.